﻿ What is Tibet Permit - What is Tibet travel permit? Issued by the Tibet Tourism Bureau, Tibet Permit (also known as Tibet visa) is an A4 size document that allows you to enter and travel in Tibet. Tibet permit has been existed since the 1980s when Tibet firstly opened its door to foreign tourists. There are actually 3 kinds of different permits, and generally the Tibet permit we often mention refers to the Tibet Entry Permit (the A4 size document). On this permit, your full name, nationality, passport number and itinerary in Tibet are written clearly item by item, all the info will be checked at airport or train station; only all the info on the permit matches that on your passport correctly, can you get onboard of train or flight to Lhasa. 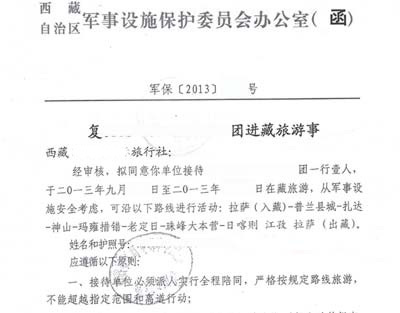 So, Tibet Entry Permit is the first permit, also the most important permit you need for your Tibet tour. 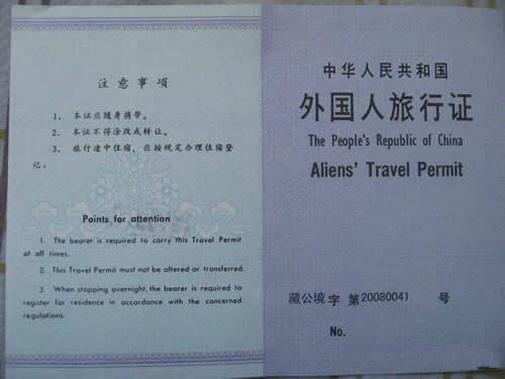 Besides the Tibet Entry Permit, the second most common permit is the Alien’s Travel Permit (ATP). This permit is required only if you visit some special restricted areas, such as Mt. Everest, Syaka Monastery, Samye Monastery, Mt. Kailash and etc. This permit will not be issued to you before the tour; it will be issued at local Public Security Bureau which administers the attractions. For example, if you have Mt. Everest on your visit, you can only get the ATP at Public Security Bureau in Shigatse, because Mt. Everest is located in Shigatse, while if you have Samye monastery on your visit, you can only get it at Public Security Bureau in Tsedang, because Samye Monastery is in Tsedang. However, you will not go to apply for ATP by yourself, your guide will help you to get the ATP at Public Security Bureau, you just have to wait for your guide in the vehicle, the process takes about 30 minutes and maybe more depends on how many tourists there. The third permit, Tibet Military Permit, is rarely used as only a few special tours involved, such trekking tours, Mt. Kailash tours and overland tours to Lhasa from Sichuan or Kunming. It takes nearly 2 weeks to get this special permit.